Are you visiting family or friends soon and would like to shower your host with gifts, preferably something unique and fabulous? Then this chocolatey-fruity recipe is right up your alley! After all, you can never go wrong with an edible gift, and thanks to the fruit and nuts, the recipient can at least feel like they're eating a bit healthier. 1. Heat the water and sugar together in a pot over medium heat. 2. 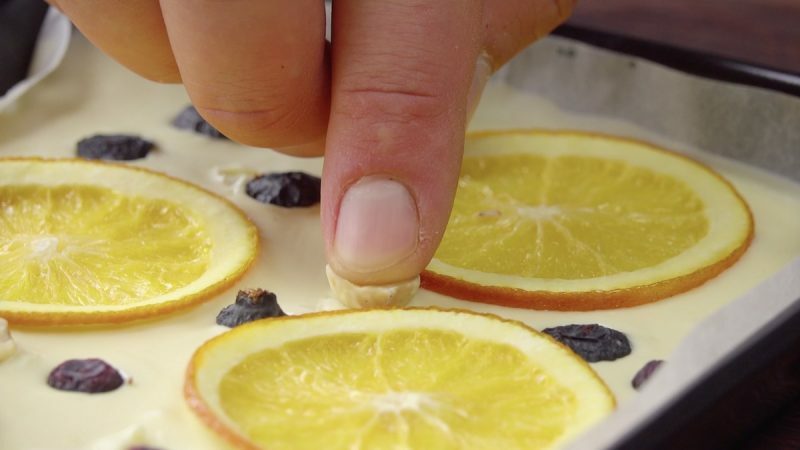 Slice an orange and then submerge the slices in the boiling sugar water for about 20 seconds. 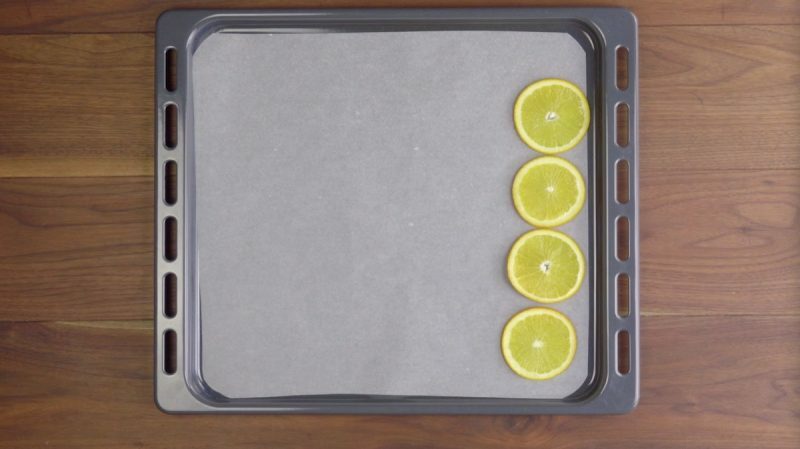 Drain the slices and place them on a sheet pan lined with parchment paper. 3. Slice the strawberries and halve the blueberries and place them on the pan next to the orange slices. 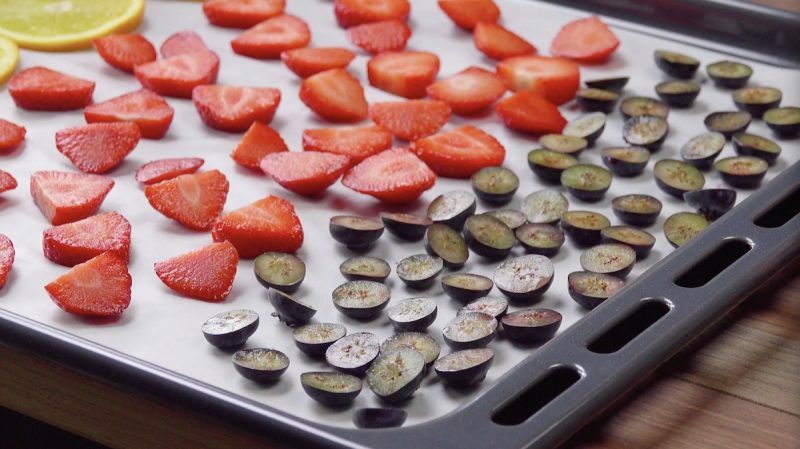 Dehydrate the fruit by cooking it in an oven set to 225°F for 90 minutes. 4. 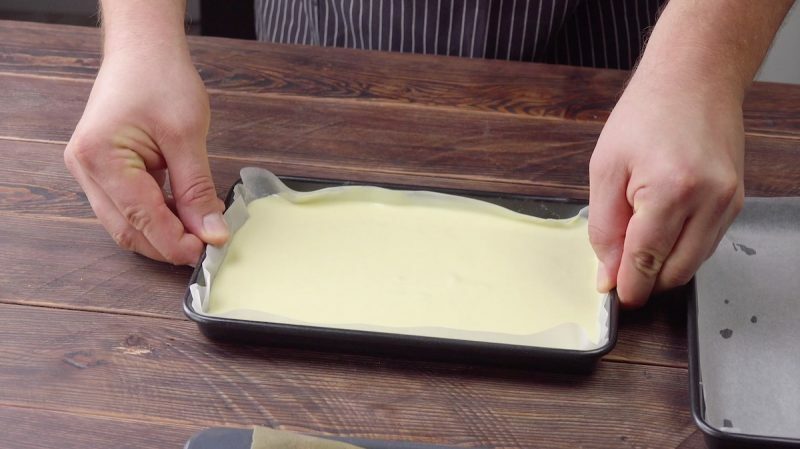 Line two 11 x 7 inch baking pans with parchment paper. Melt both the white chocolate and dark chocolate in a water bath and then pour one chocolate in each pan. 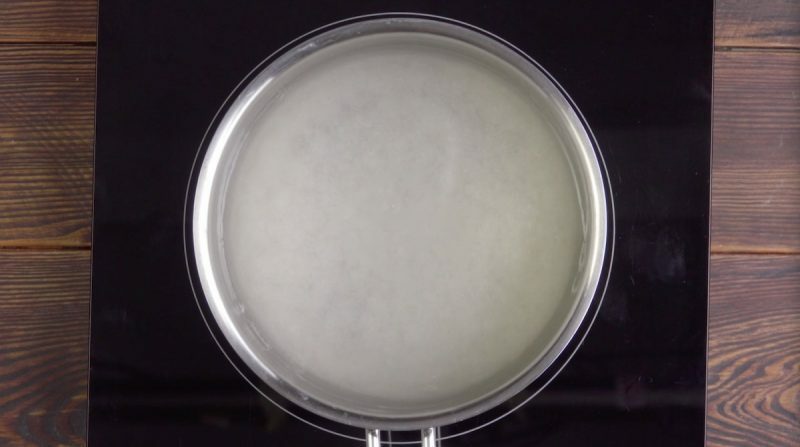 Tip: After pouring the liquid in the pan, gently shake or tap the pan against the table top to get it to settle evenly. 5. 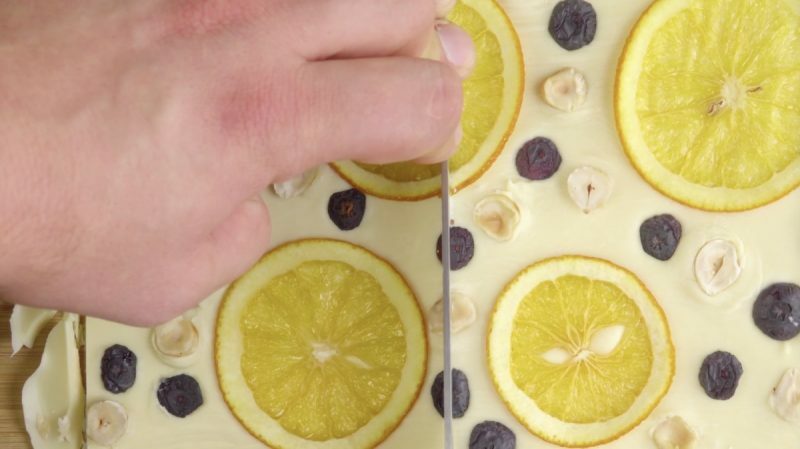 Evenly distribute the orange slices, blueberries, and hazelnuts on the white chocolate. 6. 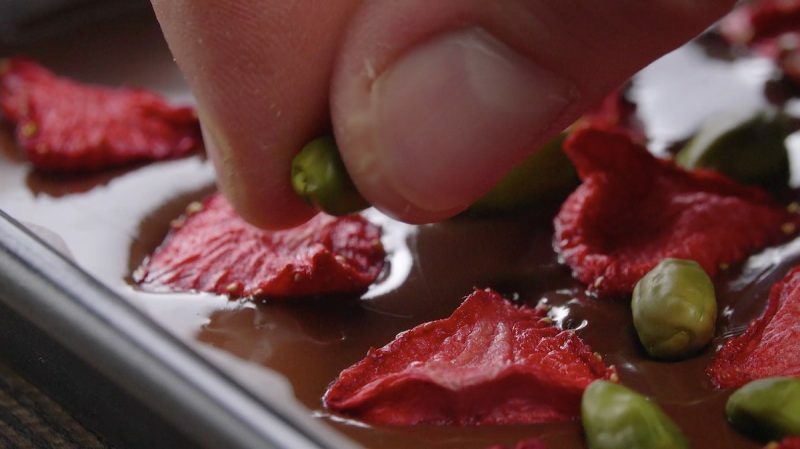 Now do the same with the strawberries and pistachios on the dark chocolate. 7. Allow the chocolate to cool and harden. Then remove the chocolate bark from the pans and cut them into rectangular bars. 8. Finally, cover each chocolate fruit bar halfway with a decorative napkin and wrap it in cellophane. Wrap a colorful ribbon around the bar and make a bow for a finishing touch. 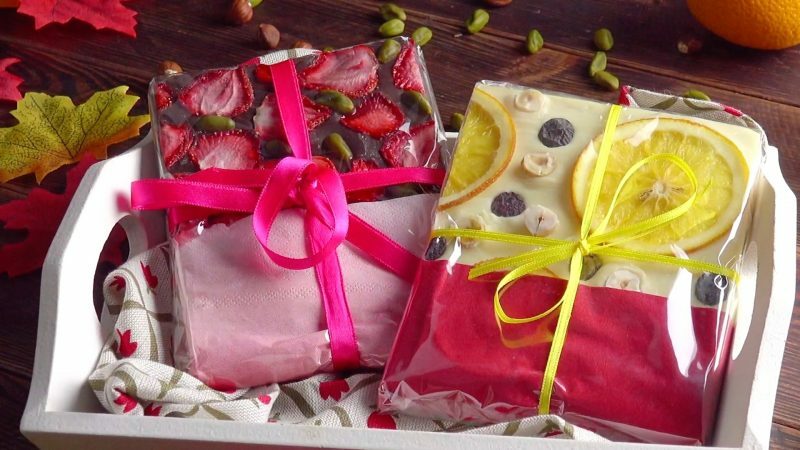 Don't these boxed chocolates with dried fruit look wonderful? How charming! You can find the recipe for the Hot Chocolate Spoons featured in the bonus video here.